Carnegie Mellon University’s Baruch Fischhoff has won a 2018 Carnegie Corporation of New York Andrew Carnegie Fellowship. Fischhoff is one of 31 scholars and writers who will receive $200,000 to devote significant time to research, write and publish in the humanities and social sciences. The awards build on Carnegie Corporation of New York’s century-old philanthropic tradition of investing in creative scholarly research. The 2018 awards total $6.2 million, making it the largest pool for humanities and social sciences research. Fischhoff, the Howard Heinz University Professor in the Department of Engineering and Public Policy and Institute for Politics and Strategy, is a world-renowned expert in decision science. His project, “Decisions,” will produce a book drawing together his decades-long experiences studying and observing individuals and institutions facing difficult decisions in diverse settings. “As one of the intellectual founders of decision science as a field, Baruch Fischhoff has written seminal papers on decision making in domains ranging from health to the energy and the environment to national security. He was the driving force behind the Dietrich College’s decision science major, which was the first of its kind. This award is a great testament to everything he has contributed to the field so far, and I’m sure that the book will serve as an invaluable resource,” said Richard Scheines, dean of the Dietrich College of Humanities and Social Sciences. Fischhoff’s book will focus on how to increase the range of autonomous decision making without denying people needed protections. It will consider how to use analytical procedures to inform, rather than replace, judgment and how to engage laypeople in situations when they must depend on experts’ knowledge and claims. Fischhoff hopes that it will contribute to both public discourse and academic research. Fischhoff, a member of the National Academy of Medicine, will be formally inducted into the National Academy of Sciences this Saturday. A cognitive psychologist by training, Fischhoff joined the CMU faculty in 1987 and has served as an adviser to many governmental agencies, including as founding chair of the Food and Drug Administration Risk Communication Advisory Committee and the Environmental Protection Agency Homeland Security Advisory Committee. 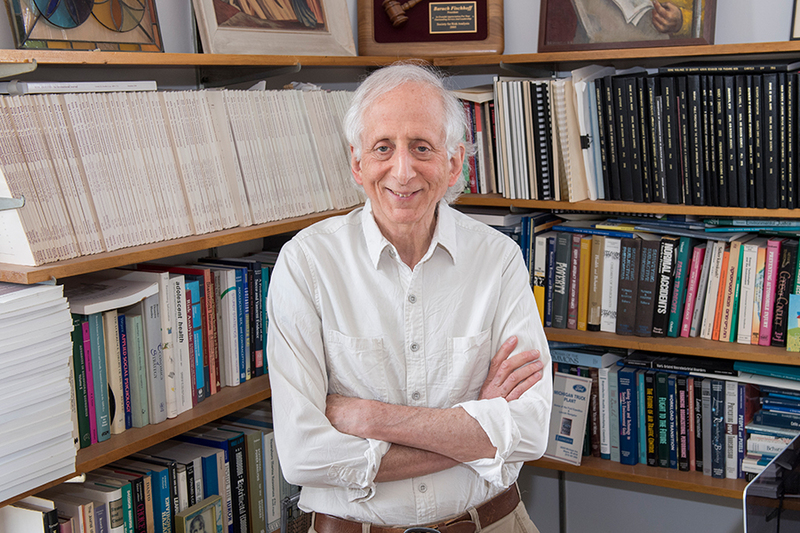 Recently, he chaired the National Research Council Committee on Behavioral and Social Science Research to Improve Intelligence Analysis for National Security and co-chaired three National Academy of Sciences Sackler Colloquia on the Science of Science Communication. Fischhoff is a past president of the Society for Judgment and Decision Making and of the Society for Risk Analysis. He is a Fellow of the American Psychological Association, the Association for Psychological Science, the Society of Experimental Psychologists and the Society for Risk Analysis. He has published many articles and books, including "Risk: A Very Short Introduction." CMU alumna Shahzeen Attari, associate professor of public and environmental affairs at Indiana University, Bloomington, is also among the 2018 Andrew Carnegie Fellowship winners. Attari, who received her Ph.D. in civil and environmental engineering and engineering and public policy in 2009, will work on a project titled, “Motivating Climate Change Solutions by Fusing Facts and Feelings." In 2017, David Danks, the L.L. Thurstone Professor of Philosophy and Psychology and head of the Department of Philosophy, won an Andrew Carnegie Fellowship to explore trust and autonomous technologies.